This image vocabulary was developed to support children to communicate about a range of important issues. It is designed to be used as a flexible, child-centered resource. 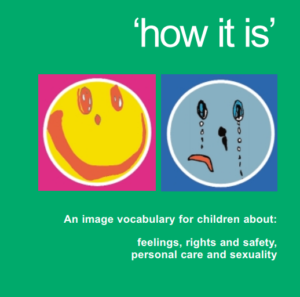 This booklet was developed to help children to communicate about their feelings, their bodies, their rights and their basic needs. More than 100 children and young people contributed by drawing or commenting on images. The booklet can be used by health and care professionals to facilitate safeguarding conversations with children and young people. This resources comes from NSPCC and Triangle.